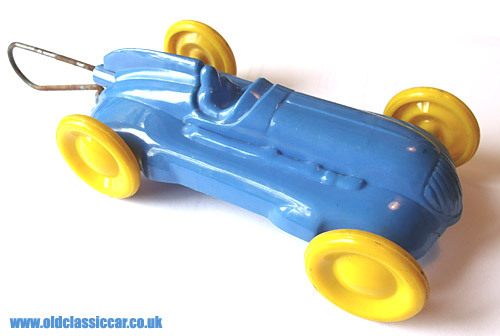 Airfix plastic toy racing car. The name Airfix will ring a bell with most people, most likely because of the epic range of plastic construction kits that they've sold over the years. This 6" long racing car is one of the less well known of the Airfix products, and it was only after taking this photo that I spotted a faded "Airfix" formed in the plastic moulding underneath. Prior to that I had no idea who had made this 1950s toy racing car. Unlike the Airfix kits, this doesn't incorporate a large number of small plastic pieces that need glueing together. The main body of the car is a one-piece moulding, into which two steel axles are fitted, each with a plastic wheel attached to it. Glued in beneath the body is a plastic tube that runs the length of the car, incorporating a spring. The tube exits the rear of the toy, into which the metal launcher is prodded. As the launcher is pushed into the back of the car, it compresses the spring, and the launcher hooks into a catch on the back of the car, keeping the spring under pressure. When you want to launch the car, just squeeze the launcher and it disengages from the catch, and the car launches away as the spring de-compresses. The body is made from very thin plastic, and I'm amazed that the catch, into which the launcher hooks, hasn't broken off. Whether this toy grand prix car was sold as a complete car, or required the tube and spring to be installed by the excited youngster, I don't know for sure. Airfix started in business in 1939, founded by a Hungarian, and now is part of the Hornby empire.